One frequently overlooked component of the Middleborough municipal waterworks system were the watering troughs which were installed in 1886 in key locations in the district a year following construction of the waterworks. Troughs varying in construction were established at the intersections of North and Oak Streets, East Main and Montello Streets, Center and Stations Streets, Wareham Street and Barden Hill Road, and on South Main Street near the Town Hall. The South Main Street trough was the most elaborate. Built of a solid block of granite with a hollowed out basin at the top for horses, it also featured a niche at the front “into which water trickled at a lower point so that passing dogs could lap up some nice, cool running water.” The two troughs at North and Station Streets were also cut from solid blocks of granite, but were less finished than the South Main Street one. The trough at Montello Street was built of iron, later being replaced by the present concrete version, while the Barden Hill trough was also “of metal, shaped like a huge saucer.” All were fed with water from the municipal system. The Middleborough Fire District which operated Middleborough’s water department independently of the town until 1919 was paid by the town for the provision of water in these troughs which was supplied by means of an iron pipe fed from the street mains. The troughs operated seasonally with water being turned on each spring and shut off for the season in fall. In addition to the Fire District, the Board of Health was also involved with the operation of the troughs in order to ensure a supply of pure water, the maintenance of sanitary conditions and the prevention of disease. In late 1908, the board was engaged in improving sanitary conditions about the trough at North Street, and was “laying a pipe of sufficient size to carry off the overflow.” In July, 1914, Dr. T. F. Conway was busily engaged in cleaning and disinfecting the town troughs. Increasingly, debates over the control of the troughs and which board ultimately had authority over their operation led to water being supplied inconsistently, much to the detriment of the horses which they served. About 1913, the Board of Health had ordered the water to the troughs shut off due to the prevalence of glanders, a bacterial disease of horses caused by ingesting contaminated water or food. The water department refused to resume the supply in 1914 until the town paid $670.99, the sum for water supplied in 1912 and 1913. Though the town acquiesced to paying the sum, water was not immediately turned on. In early May, 1914, teamsters and nearby residents complained that the water supply to the troughs had yet to be resumed. At the time, the Gazette blamed the fact on the recent assumption of control over the troughs by the Middleborough highway department, the superintendent of which was proposing the erection of cranes as a more sanitary means of watering horses than the troughs. While such devices were no doubt more hygienic, the delay in installing them or resuming water to the troughs that spring was inexcusable. “When the horse is in want of water it is rather tough to have to beg it from somebody’s house”, remarked the local paper. Ultimately, the water appears to have been turned on. Five years later, failure to once again turn on the water in the town troughs in the spring of 1918 led to the intervention of the Massachusetts Society for the Prevention of Cruelty to Animals and a political argument between the Board of Selectmen and the water department, still operating independently of the town. On April 25, 1918, the Board of Selectmen ordered that water be supplied solely to the town barn and the Center Street drinking fountain, and not the troughs which remained bone dry. “Many a horse with tongue protruding was seen driven to the troughs [in mid-July] only to find that these were dry”, recorded the Gazette which suggested that the matter was one for possible legal action by the M. S. P. C. A. Taking his cue from the newspaper, Francis H. Rowley, president of the M. S. P. C. A. wrote the town stating that “this is the first instance that I have ever known in the history of Massachusetts, where a town has felt that it could not afford to supply water for its faithful servants, the horses.” Though the Gazette doubted that “the town is in such poor financial condition that it cannot afford to provide water for the thirsty equines”, Rowley proposed soliciting funds himself. Alvin C. Howes, superintendent of the Middleborough Water Department responded to Rowley: “It is rather difficult to reply to the communication, owing to the complication of statement that it contains, without creating a controversy that should not be created.” Howes then proceeded to create that controversy after dismissing Rowley’s well-intended intervention by placing the blame squarely upon the Board of Selectmen who ordered the water shut off in April. "If this order, which I do not question the right of the selectmen to issue, had not been received, there would now be water in the troughs, as it would not have been shut off, but having been shut off what is the remedy? … I can suggest a remedy, a very simple and quick one. If the selectmen, who alone have authority to do so, instruct me to turn on the water, it would at once be done, as I know the public spirited citizens of this town will see that it is paid for when the time comes, that it should be attended to without any outside assistance and all that is required is the authority to turn on the water." With the increasing use of the automobile and the decreasing numbers of horses on the roads, the troughs in time became obsolete and their use abandoned. Despite their somewhat obtrusive presence in the intersections where they were located, the troughs remained in place. (As early as 1914, an automobile struck a trough. On July 5 of that year, an auto collided into the Barden Hill trough, tilting it to one side and “causing the water to flood the street”). On various occasions, however, efforts have been made to remove the troughs from their locations. In 1953, antique dealer and auctioneer William L. Tallman sought to purchase the South Main Street trough from the town. At the time, the Station Street trough was still in place, but described as “cracked”, while the North Street trough was being used as a bird bath. The Barden Hill trough at that point seems to have been long gone. 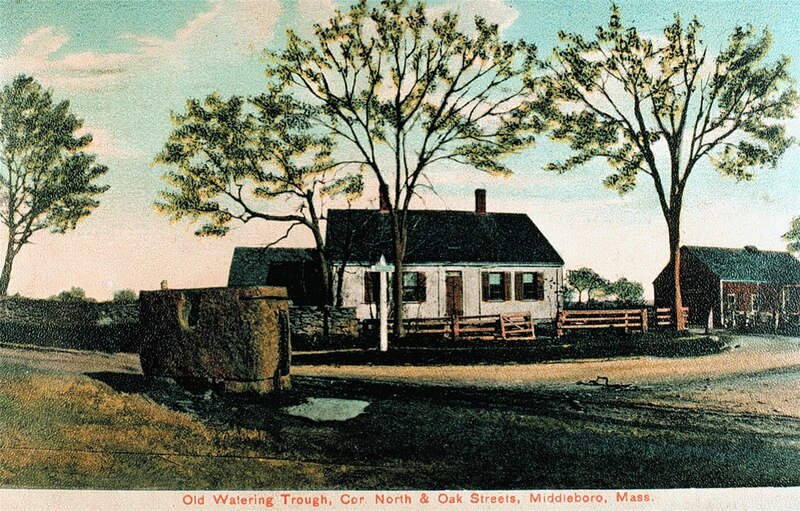 Apparently in view of the South Main Street trough’s obsolescence, “he figured the watering trough might be for sale.” Tallman suggested that the selectmen name a price (“I do not want to dicker”, he told them), but his refusal to indicate precisely why he wished to purchase a trough coupled with the Middleborough troughs’ landmark status, prompted the selectmen to table the matter indefinitely. Brockton newspaperman James H. Creedon later revealed that Tallman wanted the trough to sell to a client for use as a grave marker. While the South Main Street trough was saved in 1953, it once again came under threat during the 1960s reconstruction of South Main Street. Efforts by the Floral Beautification Committee, however, saved the trough which was relocated to the lawn of the Town and subsequently as a planter. 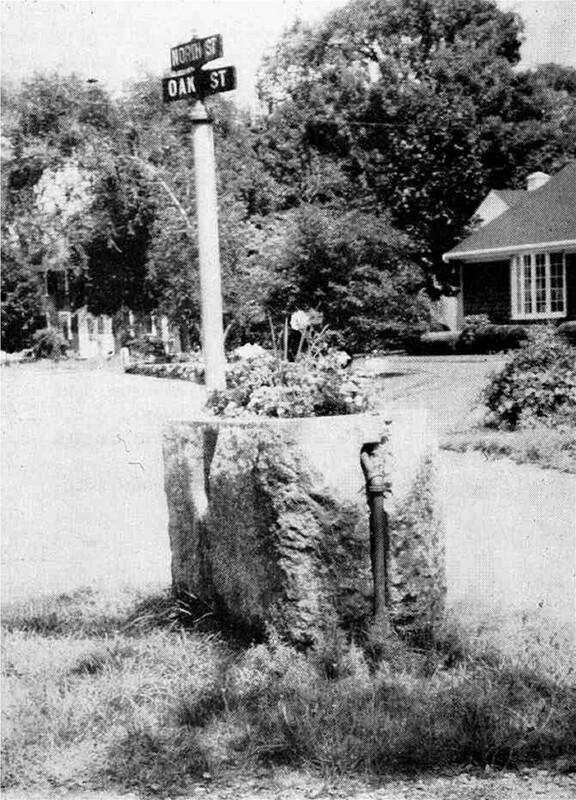 In 1965, a suggestion was made that the North Street trough be removed to the grounds of the Middleborough Historical Museum on Jackson Street, a proposal which raised the hackles of both the Middleboro Garden Club and the Nemasket Community Club, an organization of neighbors from Oak, North and Nemasket Streets. 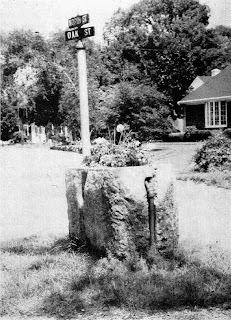 Writing the Middleborough selectmen on behalf of the latter group, Mrs. Lillian Cassidy said of the North Street trough, “It is one of the few reminders of the past and in no way disturbs the progress of the town.” The trough was permitted to stay and like the South Main Street trough was subsequently used for planting by the garden club. Today three of Middleborough’s troughs are still extant in or near their original locations - North and Oak Streets, East Main and Montello Streets, and on the Town Hall lawn – where they may still be seen. "Old Watering Trough, Cor. North & Oak Streets, Middleboro, Mass. ", picture postcard, c. 1910. Ironically, though the watering trough at the intersection of North and Oak Streets was only about 25 years old at the time this postcard was published, it was captioned as "old." The characterization of the troughs as ancient relics is fairly widespread, and there is a long-standing misperception regarding their age, many people believing them to be much older than they are. Watering Trough, North and Oak Streets, Middleborough, MA, photograph by Clint Clark, 1968. The same trough is captured in this photograph by Clint Clark dating from the late 1960s when the Middleboro Garden Club had found a new use for the troughs. Previously, it had been used as a bird bath. The iron service pipe which fed the trough is visible on the right side. This trough was placed to serve residents of the Star Mill neighborhood as well as travellers to and from the Green and East Middleborough. Though the original trough was constructed of iron, it has since been replaced by the present concrete structure. Originally this trough was situated closer to the street and further south. When South Main Street was widened in the 1960s, the Floral Beautification Committee saved it by relocating it on the Town Hall lawn and finding a new use for it as a floral planter. The basin at the base of the small niche in the front of the South Main Street trough was filled by a narrow pipe and was for the benefit of dogs. Clint Clark, "The Water-Trough Crisis of 1918", The Middleborough Antiquarian, Volume X, Numer 2, September, 1968.